In 1973, New York City artist Liz Christy and her band of gardening activists, the green guerrillas, began their quest to reclaim urban space by installing flower boxes and seed-bombing vacant lots. The group eventually came across a promising looking site on the northeast corner of Bowery and Houston in Manhattan. They cleared the rubble and trash, spread some donated topsoil, installed a fence and got down to work. In December of that year, Liz and her 25-member force approached the City of New York to see if there was a way to gain official access to the land. In April of 1974, the City's Preservation Housing Development Office authorized the rental of the lot for $1 a month, and the Bowery-Houston Community Farm and Garden was born. Sixty-raised vegetable beds made up the garden's initial configuration, and trees and herbaceous borders were later added. In its second year, the Bowery-Huston won the Mollie Parnis Dress Up Your Neighbourhood Award and became the urban community garden model that spread throughout New York's five boroughs. The original green guerrillas started running workshops and showing other urban gardening groups how to get started. In 1986, the Bowery-Houston was renamed *Liz Christy's Bowery-Houston Garden in memory of Liz Christy, who died of cancer at the age of 39. In a recent post, I wrote about a pair of St. Henri. gardening activists, Thoresten Hermann and Fraser Wilkinson. Via Facebook, Hermann informed me of some new developments in their community garden project, which has the entire street abuzz. The City of Montreal, through its organization Eco-Quartier, has offered them topsoil to get started this year. In addition, they will be receiving a few pear trees as an added bonus (however, no mention of a partridge to date). Hmmm...topsoil and pear trees. Looks like the City is complicit in the boys' plan for a community garden, as municipal authorities have yet to ask either Hermann or Wilkinson if they own the land they're cultivating. Is the City aiding and abetting, or is the City actually the owner and getting some landscaping for free? It really doesn't matter. Everyone is a winner. 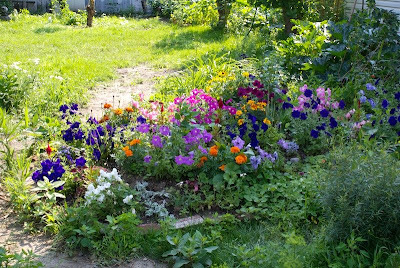 The Delinelle Street residents in St. Henri have a beautiful green space, Hermann and Wilkinson can enjoy gardening, and if the owner ever shows up, s/he has an attractive lot that has been cleared free of charge. : More On Guerrilla-ing in NYC and St. HenriTweet this! Damn, is it ever hard to comment on your blog. from the unofficial gardens they face an instant and aggressive crowd. Good on the people in your neighborhood who with their efforts have mad the "Hood" a better place to live. It seems like everyone is busy gardening these days. In the East, the magnolia trees are just about to bloom. I'm looking into finding some prickly roses this year. I was looking at some with a colleague of mine today. Thanks for dropping by.